UDM Downloads > Photo Directory Software for Churches! As churches grow, it becomes more and more difficult to "put a face to a name" when looking at individuals in the church database or directory. 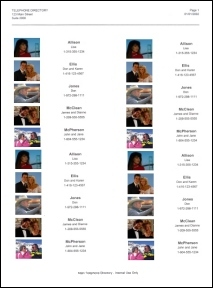 This Photo Directory application allows a picture to be added to both an individual profile and family profile. Those pictures can then be viewed in a printed photo directory, or compiled into a directory of individuals or families. In addition to being able to view a picture directory for the entire church, a complete phone listing can also easily be created.